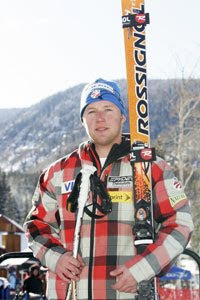 Andrew Weibrecht, the first Lake Placid alpine ski racer to compete in the Olympic Games, won his first Olympic medal today in the Men's Super G when he took the bronze, just .03 seconds behind fellow American racer Bode Miller. The Americans Miller and Weibracht were first and second, respectively, for a little while this afternoon in Canada until, once again, Norwegian racer Aksel Svindal laid down a beautiful run to grab the gold. Canadian TV (CTV) did a great job with the live coverage. It was another one of those exciting races that caused normally calm people to jump up and down and yell at the television. Andrew was raised in Lake Placid and attended Northwood School were he was a member of the Northwood School Ski Team, coached by the legendary Guy Middleton. Child number four in a skiing and competitive family of five, Andrew had to ski hard and fast to keep up with his older siblings, which turned out to be an effective training technique.